Theresa May leaves Brussels with no significant progress in Brexit talks. Conservative MPs on all sides of the party are losing patience with her leadership. One MP, Johnny Mercer, described his party as a “shitshow” and said he wouldn’t vote for it if he wasn’t an MP. 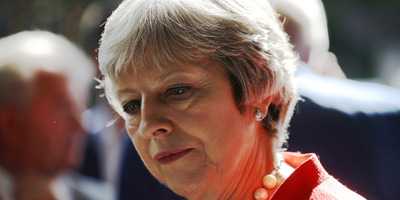 BRUSSELS, BELGIUM – Theresa May returns to Westminster on Friday facing one of the most dangerous weeks of her premiership, with Conservative MPs from all sides of the party losing patience in her handling of Brexit. The prime minister leaves the European Council Summit in Brussels with little to show other than a controversial suggestion that 12 months could be added to the proposed 21-month transition period to deliver an orderly exit. Conservative MPs reacted furiously to this on Thursday. Nick Boles, who up until now has been relatively supportive of May, said the news had pushed Tories “close to despair.” Pro-Brexit MPs made fresh calls for May to be ousted. Former Brexit Secretary David Davis is reportedly angling for a leadership challenge backed by angry pro-Brexit MPs like Nadine Dorries, who openly called for Davis to replace May on Thursday. In an extraordinary interview with The House magazine, pro-Remain MP Tory Johnny Mercer described the government as a “s***how” and said he wouldn’t vote Conservative or at all if he wasn’t an MP. May will today be encouraged by reports that French President Emmanuel Macron and German Chancellor Angela Merkel want the EU to be “more flexible” and create a Brexit that deal could be palatable for Brexiteers in London. However, even if Brussels commits to May’s preferred UK-wide customs union backstop in the Brexit deal, there will almost certainly be a backstop keeping Northern Ireland in the single market and customs union. The UK and EU believe they can reach a deal which includes the Northern Ireland-only backstop but is acceptable for the Democratic Unionist Party. This is just one of many huge risks May will have to take in the coming weeks. In a press conference on Thursday, the prime minister also appeared to kill Brexiteer hope that the backstop would be time-limited, refusing to deny reports that she privately told Ireland there’d be no fixed end date. The time-limit issue is a big deal for Brexiteers. They believe failure to include one in the final Withdrawal Agreement risks trapping Britain in a long-term if not permanent customs union with the EU. Business Insider reported last week that three ministers – Andrea Leadsom, Penny Mordaunt and Esther McVey – are all poised to quit if May doesn’t deliver a fix end date for the backstop. In Brussels, the expectation is if there is a deal, it won’t be ready to be signed off until the European Council’s December summit, leaving parliaments there and in Westminster just weeks to scrutinise and vote on it.